The first four seasons of the historical drama following the adventures of a Viking clan. The series follows Ragnar (Travis Fimmel), a Viking chieftain who, with help from his brother Rollo (Clive Standen) and wife Lagertha (Katheryn Winnick), plots to become king. A formidable warrior, Ragnar often leads his men on raids overseas. However, even as he makes a name for himself on the battlefield, Ragnar must be aware of rivals plotting behind his back in his homeland. 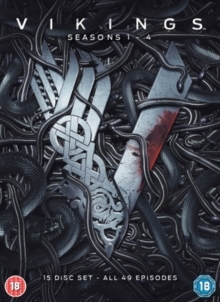 Season 1 episodes are: 'Rites of Passage', 'Wrath of Northmen', 'Dispossessed', 'Trial', 'Raid', 'Burial of the Dead', 'A King's Ransom', 'Sacrifice' and 'All Change'. Season 2 episodes are: 'Brother's War', 'Invasion', 'Treachery', 'Eye for an Eye', 'Answers in Blood', 'Unforgiven', 'Blood Eagle', 'Boneless', 'The Choice' and 'The Lord's Prayer'. Season 3 episodes are: 'Mercenary', 'The Wanderer', 'Warrior's Fate', 'Scarred', 'The Usurper', 'Born Again', 'Paris', 'To the Gates! ', 'Breaking Point' and 'The Dead'. Season 4 episodes are: 'A Good Treason', 'Kill the Queen', 'Mercy', 'Yol', 'Promised', 'What Might Have Been', 'The Profit and the Loss', 'Portage', 'Death All Round', 'The Last Ship', 'The Outsider', 'The Vision', 'Two Journeys', 'In the Uncertain Hour Before the Morning', 'All His Angels', 'Crossings', 'The Great Army', 'Revenge', 'On the Eve' and 'The Reckoning'.